6 Tips to Install Successful IP Video CCTV System - A blog about IP video security solution. CCTV video camera system becomes popular this year. We see the CCTV cameras setup around convenience, stores, restaurant, office, hotel, even the house. Here is the question: does the video surveillance system really work as we expected when crime happens unfortunately? The below we have several tips to make your video surveillance system strong rather than vulnerable to the criminal. Protect your CCTV cameras. Most of the CCTV cameras are installed around the perimeter. The burglar will try to disable the cameras before they enter your property. Select the dome type cameras which are not easy to change the shooting direction. If burglars change the shooting direction to the sky, the camera turns to be useless. You also can install the camera higher. However it needs to put the camera shooting closed to eye level rather than the head of a person. The camera should install a little bit far from watching slot with narrow angle lens. 6-22mm varifcoal lens camera will be fine. Last thing is putting a tube to protect cable and connection from cutting off. What if the criminals manage to disable the whole system? Or your system is already there, you just don't want anybody to touch it. 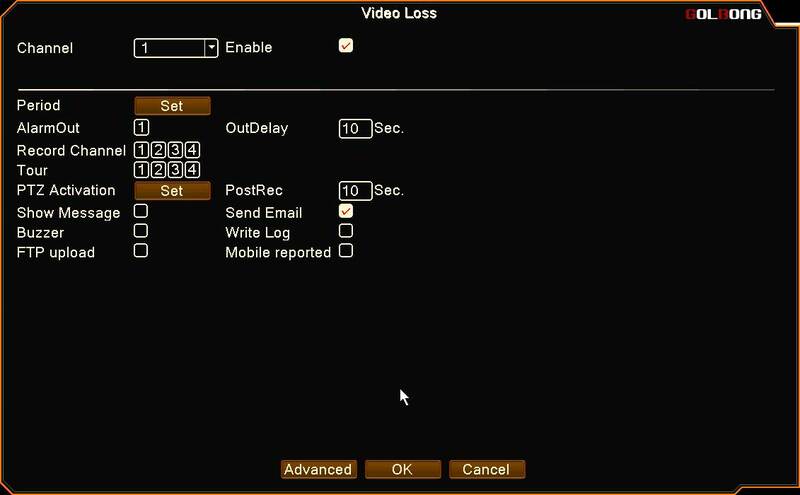 You still can configure the 'video loss' function to notify you in your NVR (network video recorder). Once NVR detects the video loss in a channel, it will send an email or push message to your smart phone, alert you one of your cameras is dis-connected. Generally speaking, making sure your cameras are always working is the first step. Checking the camera footage regularly. Some of the crimes happen at random, but some are not. Checking the footage may discover the suspect before bad things happen. However watching footage is boring and time consuming processing, It could take you 1-2 hours to watch 8 hours footage. You can enable the motion recording to save your watching time. I knew people always say motion detection generates false alarm from pets, light even wind. Here we only use motion detection to highlight the footage with motion, so it can help us locate the interested footage fast. It doesn't matter the false alarm, you still can save plenty of time. Simple enable the motion recording will make it work. Then you only need to review the footage with red tag. Connect IP camera to an external sensor, such as door contact or PIR sensor. 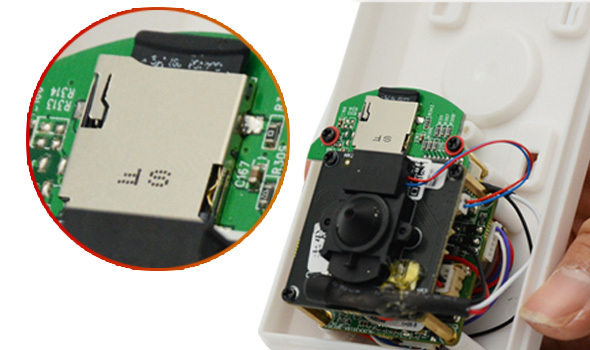 The motion detection can generate the alarm trigger. However it is easy to create false alarm like we mentioned above. If the alarm is not accurate, we will start not trusting the notification very soon. 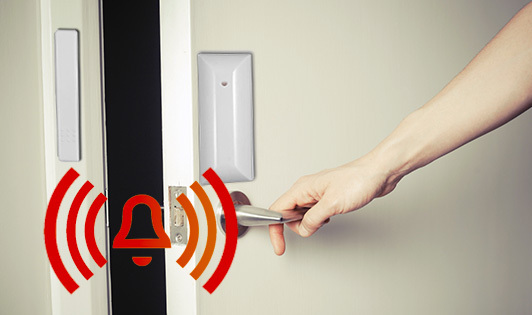 We need an external alarm device such as door contact or PIR sensor to generate accurate alarm. If your IP camera supports external alarm input. You can connect a door contact to the camera and configure the camera to send you an email when the door is open. This is especially useful when you are out of town. You can simple disable alarm notification on the recorder after return. Covert camera with on board storage. Most of the burglars will be off guard even takes off the mask after they believe the video surveillance system is disabled. A covert camera can capture the details of criminal. It is important to separate the covert camera from your regular CCTV system which always has NVR/DVR and a monitor, once the criminal manage to locate your recording device, they can discover all the monitor spots. 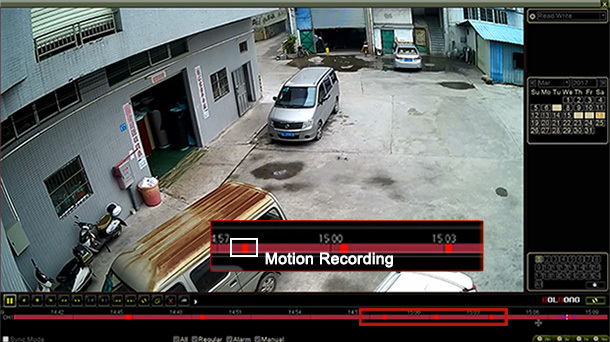 Separate the covert camera from your CCTV system can protect the footage even after all the monitor spot are made out. Remember putting a TF memory card on the covert camera to record the footage. You still can connect your covert camera online, just don't connect to the CCTV system and don't display the live on the monitor. You can check the live and footage with smart phone over network. UPS backup. The criminal may dis-connect your power. No devices can work without power. You can have ups to back up the whole CCTV system or simple mono ups attached to the cameras. In the second solution, the camera require on board storage. Enable the "network disconnected recording" trigger, the camera will start recording the footage when the network is disconnected. Thanks for sharing these great tips of successful CCTV installation. If you are looking for a reliable service provider to complete access control system installation in NY, contact us today. Very Informative to installing easy way of Ip Security CCTV Camera System in Our Office. Thanks for sharing the Tips in this blog. Greatful.